How to Stop Struggling to Live Within Your Means | Good Life. Better. I often hear single people complain that not having an accountability partner makes it especially hard to live within their means. I guess that can be true. But too many of my coupled friends struggle with money for me to believe having someone in your life who can monitor your spending is a foolproof plan. The way I see it, whether coupled or single, you always have access to an financial accountability partner: you. Don’t laugh–it’s true! No one is better positioned to know what you earn, owe, and spend. You just need to use that knowledge to your advantage. To help you out, here are some tips for sticking to your spending plan that don’t rely on another human being looking over your shoulder, including guard rails you can put in place that will prevent you from crashing. 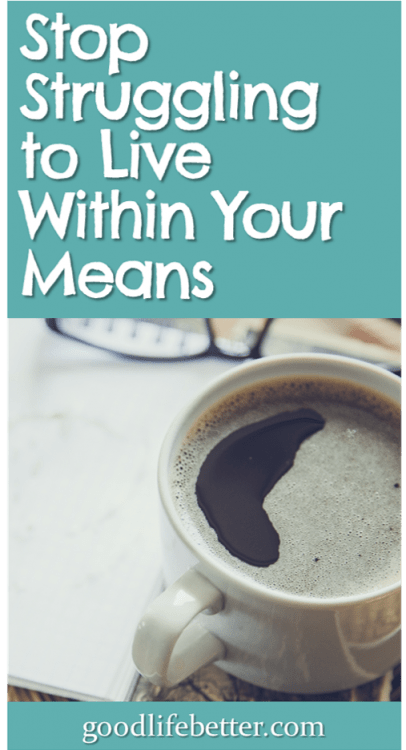 Knowing exactly how much you have to spend may seem such an obvious part of living within your means that it doesn’t even belong here. But based on my own experience with overspending, not only does it need to be on this list, it needs to be first on this list. For too many years I would get to end of the money long before I got to end of the month. And you know what that meant, right? Using credit cards to make up the difference. Yes, buying stuff I didn’t need contributed to going over budget. But even more so was the fact I didn’t understand exactly how much I had to spend once all the necessities—including the money I was investing for retirement—were taken care of. At a minimum, I wish I had tracked what I was spending on food for a few months so I would have known how much I needed to allocate to that bucket. This would have allowed me to be so much more realistic about what I had available to spend on entertainment and clothes, for example. It also might have spurred me to seek out opportunities to increase my income. I think back to the first time I heard Dave Ramsey tell a caller that the caller didn’t have a spending problem so much as an income problem. It was a light bulb moment for me. When I was very early in my career and only making around $22,000 a year, I would get so mad at myself for not being able to stick to my budget but in truth, I wasn’t making enough to cover my expenses. If I had just sat down and done the math, I might’ve been kinder to myself and channeled that anger into finding a new job. During my debt-payoff journey, I remember telling a co-worker about my plan to pay off almost $60k in debt in 16 months. She was very impressed and wanted to know more about how I was able to resist spending money on anything other than the necessities. It’s a realization I have gone back to again and again. For years I had vowed to “pay off debt” or “fully fund my Roth IRA” and not followed through. 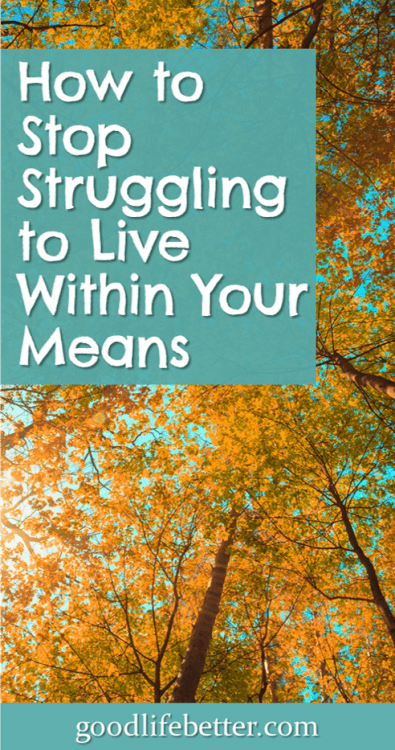 This time, my goal was to no longer have the crushing weight of debt resting on my shoulders, creating unnecessary stress and limiting my options to shake up my career and retire in my 50s. This clarity as to why I needed to be super frugal for a short period of time made doing the things I needed to do to get out of debt and then max out my retirement accounts infinitely easier. Which makes complete sense. Today, I’m going to transfer money from my savings account to my Roth IRA. Today, I’m moving one step closer to financial independence. My guess is it isn’t the first one! And if I’m right, then sit down and figure out your “why” of living within your means. It may be just what you need to make it happen. Now that you know why you are going to start living within your means, it’s time to create a plan to make it happen. Dave Ramsey says to give each dollar a job and I think that is great advice. I get paid every two weeks so what I did was create a list of all my monthly bills and allocate some to the first check of the month and some to the second check of the month (if your bills don’t naturally fall into this pattern, you can usually call the company and adjust your due date). Once that was done, I added lines for the amount I need to set aside to max out my Roth IRA ($500 a month in 2019) and to contribute to my after-tax savings account. Finally, I added a line for my weekly allowance which has to cover food, gas, clothes, pedicures, entertainment, etc. An allowance? Really? Yes. I’ve found that giving myself a small pot of flexible funds works best for me as being too structured triggers my inner rebel. The key is to be very specific about the amount, what it covers, what happens if you go over, and what happens if you don’t spend it all (that’s a rarity for me but it has happened). Once you do this, you’ll have what I think of as a high-level budget. You may also have a realization that you don’t make enough to cover all your bills and still leave you with money to cover your day-to-day allowance. If this happens, you need to figure out your next step. Cutting expenses is a no-brainer but how you do that is up to you. Can you eliminate some nice-to-haves, like eating out and cable? Can switching cell phone providers free up some money? For bigger impact, can you lower your housing and transportation costs? This could mean moving, finding a roommate, swapping a gas guzzler for a car that gets better gas mileage, or negotiating a different insurance policy. In addition to lowering your expenses, can you increase your income? You could start a side hustle, seek out new opportunities at your current job, or move to a different company offering better pay. All of these changes take effort and time, and there will inevitably be days when you will feel discouraged. When that happens, go back to your reason for saving. Once the fear of having an emergency expense you won’t be able to cover is gone, won’t the effort be worth it? Or you’ve finally saved enough to attend that month-long writer’s retreat? Or you turn in your retirement papers? 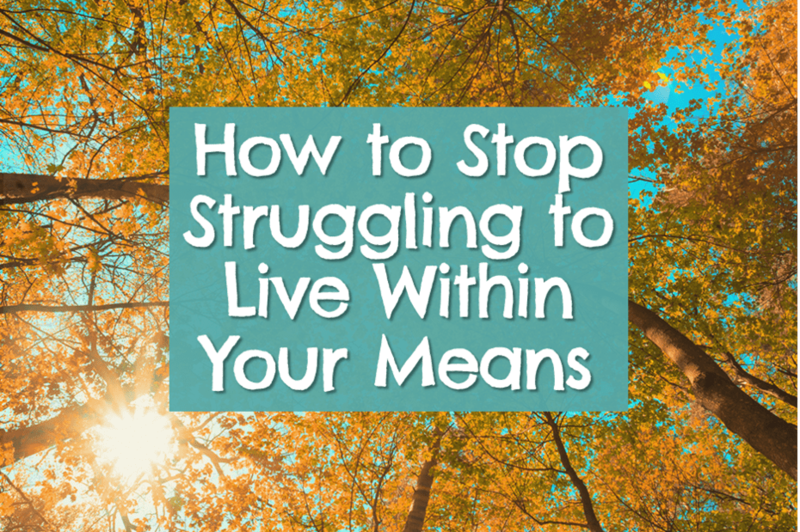 This is why figuring out why you want to live within your means is so very important—it will get you through those sucky moments that are bound to crop up. After paying off the last of my debt in May of 2018, I will confess to being a little haphazard with my spending. After a few surprise months I realized I needed to do two things to get my mojo back: 1) get straight on my next goal and 2) start tracking my spending again. Tracking meant I couldn’t ignore how much I was spending and on what. And setting my next goal made real the impact my spending was having on the future I want to create for myself. If I’m okay with that future looking a little different, or being a little further out from where I’d initially hoped it would be that’s fine. I’m a grown woman and re-calibrating my plans is okay. Getting back on track is fine too. What matters most is that I know what’s happening and I take charge. As the saying goes, knowledge is power. As I wrote about here, it wasn’t exercising supreme will power that got me started on the path to financial independence. It wasn’t reading an inspiring book (or blog) or being unable to pay my bills. It wasn’t even hating my job and wanting the freedom to pivot to something I found more meaningful. Nope, the thing that got me going was a three month no-spend challenge: no new clothes, shoes or purses between Memorial Day and Labor Day of 2016. That challenge not only allowed me to pay down my credit cards, it forced me to think long and hard about why I shop. Spoiler alert: it wasn’t because I needed more stuff! Once the challenge ended, I was able to use what I’d learned to help me stay the course when I decided to pay off all my non-mortgage debt in 16 months. And now, those lessons are helping me do what I need to do to retire in my early 50s. So, if you’ve tried all the other tips above and still struggle, consider making a game of your spending. You probably don’t have a lot to lose and may gain everything! How Will You Help Yourself Be More Accountable? I know that living within your means—especially if money is tight—can seem about as much fun as a root canal. It’s easy to tell yourself that a little more here or there won’t really matter. I was certainly guilty of that. But a few dollars here and a few dollars there really do add up over time, especially if it’s accompanied by credit card interest charges. What do you think? Will these tips help you live within your means? Share your thoughts in the comment section! I’m at the point where I realized I can’t afford all the basics on my salary… I’ve been looking for a new job for months now. Thanks for sharing your advice! That’s great that you realized that! Job searches aren’t fun but it’ll be worth it when you have some breathing space with your money. Good luck!